A fantasy story with themes of deeper identity, and conservation. Collected into a graphic novel, the comic would make an impressive Superman story. Superman soars across the ocean, and summons a blizzard with his breath. Perspective is expertly manipulated. The artwork of tall and distant scenes, where the tiny red and blue figure of Superman flies across the ocean, or lifts a gigantic block of granite through the air, manipulate perspective expertly. Sky blue energy crackles across the opening pages. The blue and white blizzard Superman summons on his breath transforms the background from green to white. The transition flows. Vibrant colour helps build an environment for the story. There’s also a key artwork of Superman demolishing military combat drones. Possibly bringing up a link to the film Man of Steel. Under attack from the Ghost Soldier, Lana Lang and Superman defend misunderstood monsters, and stave off an airstrike. Superman and Lana Lang rescue a group of primate-like creatures from the underground land of Subterranea. The creatures evolve into monsters under the sun’s rays, however. Before Superman can act, a man named Ghost Soldier destroys them. Superman was going to save all the monsters and humans alike, until the Ghost Soldier attacked. In an attempt to stop Ghost Soldier, Superman unleashes a blizzard with his freeze breath. He apolgises for the damage he causes: A tropical jungle becomes a frozen field with billowing snow drifts in seconds. Ghost Soldiers has an edge over Superman. He might have a super-indestructible body, but the man of steel is still made of particles of elements like carbon. Phasing is the power to pass the particles of one object through another. Through phasing, Ghost Soldier avoids Superman’s ground-breaking punches, and forces a knife into his body, injuring him. Not so invulnerable, apparently. However difficult the problem appears – with ghost soldiers attacking, and several painful goodbyes – Superman pours all his energy into the defense of life and living creatures. He protects Lana and her team, safeguards his new friend named Baka, and stops an air strike – Ghost Soldier summons back-up from the sky. He’s not working alone. Themes of Deeper identity are described – a monster is not what it appears to be. Nor is a hero. Conservation themes are introduced. Superman handles childhood disappointments. Lana comments early in the comic book that what might look like a monster isn’t what it appears to be. This introduces a theme about appearances – the story deals with what’s underneath personas people express in day to day life. A theme of deeper identity features. Characters consistently discover depth beneath surfaces in this comic book. Moments of the story also touch on environment conservation themes: Superman apolgises for freezing part of a rainforest. He saves tracks of it from burning up in an air strike. This is just one example. It’s in Superman’s farewell to the young Prince Baka that the strongest moments from the story emerge. An interesting parallel is brought up. Lana knows Superman as Clark Kent from Smallville. They grew up together. She notices that when Superman feels heavy hearted, and hits his lowest point, after witnessing the destruction and wrath around him, his back stiffens just as it would when he was younger. Superman notices that young Baka’s back stiffens in a similar way when he shifts from his giant beast form into his true shape: A young child with cat-like fur, ears, and tail. Prince Baka has to leave his adventures with Superman and go home disappointed. Superman relieves childhood loss of his own. Lana watches all these events. A witness. Why associate Superman with disapointment and loss? Particularly childhood loss? Is it because Superman cannot live up to the heavy expectations he places on himself? Superman has the power to save everyone. He struggles to achieve this goal. It appears to be a clash between ideals and reality. This Superman comic book is not a cynical tale, however. He keeps Baka safe. He keeps Lana safe. He stopped an air-strike flattening five miles of rainforest. What’s written and illustrated here is a Superman comic book about reaching for the best outcome. Phasing abilities feature prominently in this comic. The power to slip through solid objects appears in X-men and Avengers comics: Kitty Pride and The Vision have this ability. Martian Manhunter from the Justice League of America can also phase. Action Comics #29 is published by DC Comics ($3.99 USD). Greg Pak (W.) Aaron Kuder and Jed Dougherty (A.) Wil Quintana (C.) Dezi Sienty (L.) Cover artwork by Aaron Kuder and Wil Quintana. Created almost three years ago, the new DC universe is about to experience a war of super-heroes. Underneath that war, another conflict continues. This battle is over a fairly fundamental question to human nature: where does evil come from? Superman, Wonder Woman, and The Batman are leading a team called the Justice League. They don’t belong to any country, and stand together as role models, and a symbol of cooperation. Amanda Waller and Steve Trevor are two people employed by the United States government with a plan. They are, understandably, reluctant to let the powerful Justice League wander freely across the Earth, despite the lives they save. Waller and Trever created the Justice League of America (JLA) as a check to the original League. A third team appeared independently of the others: the Justice League Dark set out to prevent magic and deeply supernatural events from spiraling out of control. Considering the deep supernatural nature of current events, they are pulled, inevitably, into a battle. Magic and myth play a role in this comic book story: Pandora, of the myth “Pandora’s box”, is trying to force the evil she unwittingly unleashed back into the box it came from. At the same time, the magical champion Shazam, sometimes called Captain Marvel, wants to honor the passing of his arch enemy Black Adam by scattering his ashes over the deserts of Adam’s home country. Pandora and Shazam’s missions, despite their good intentions, appear to cause a fight in the desert between the Justice League, and the JLA. Throughout the Comic book, this question is raised several times: where does evil come from? The best visual feature of the book, aside from the detailed and lifelike pencil work, is how uncluttered the actions and events flow across the panels. Speech bubbles and lettering is not a chore to read, and the character’s voices are matches expertly with their body language depicted. It’s entertaining. Pace is strong: as tensions builds in the comic book story, the size of the panels adjusts. When the tension reaches it’s peak, a full page is devoted to the action. Colour and visual effects make these full page artworks powerful images, which could stand on their own. Pandora and Superman have a brief, but important conversation – Pandora believes that all evil in the world stemmed from her opening the box, and unleashing spirits called the seven sins onto the Earth. Superman is skeptical. He states the humans are not evil because someone opened a box. Essentially, the argument is whether evil and wrong-doing has an external, or an internal source. Madame Xanadu is a card reader and psychic working for the Justice League Dark. She reads a custom built set of Tarot cards: the heroes of the DC universe are the figures, not the traditional suits and trumps found in a tarot deck. Xanadu narrates the comic book, and may have uncovered a deeper layer to the story. Aside from the Leagues and the government, the super-villains of the DC universe may be working toward a common goal. This sub-plot is underplayed to make room for the war. A showdown between Shazam and Superman is satisfying reading. Shazam can match Superman’s strength, and it’s good to see that DC have taken Superman’s extreme power levels down a notch – he cannot easily knock out Shazam, or the Martian Manhunter ( a member of the JLA with a battery of abilities). Greek myths and legends combined with Judeo and Christian writings form the foundation of this comic book. The concept of evil in the form of sin has been a part of Catholic writings and theology for two thousand years. Pandora believes that Superman can open the box, and return the seven sins to their prison. Indeed, the Catechism of the Catholic faith states that it is the role of God to save humanity from sin through Jesus Christ, the son of God. Superman is a bit like Jesus because he is viewed as a saviour, and once returned from death. Pandora makes the association too. She asks him to open the box, but that doesn’t work. Superman is corrupted by the evil of the box. What does this say about Superman? DC comics could want a limit on the association between Superman and Christ: He is a super hero, but not an eternal, spiritual saviour described in the texts of Catholic faith. The issue is more complex than it appears: it takes more than one saviour to pick out the evil parts of the world and put them in a box. That’s the key value being discussed here, alongside the origin of evil in humanity, and even the extraction of evil from human lives. Future installments could cover these questions and themes in more detail. Trinity war recruits mythology, and combines it with ideas from theological writing. By having Madam Xanadu – the card reader – acting as narrator, the comic book ties itself firmly to supernatural and fantasy themes. Trinity War (part one) presents an interesting discussion of good and evil, and provides great artwork and mystery. Justice League #22 is published by DC comics. $3.99 Geoff Johns (w). Ivan Reis (p). Joe Prado & Oclair Albert (i). Rod Reis (c). DC Lettering (l). 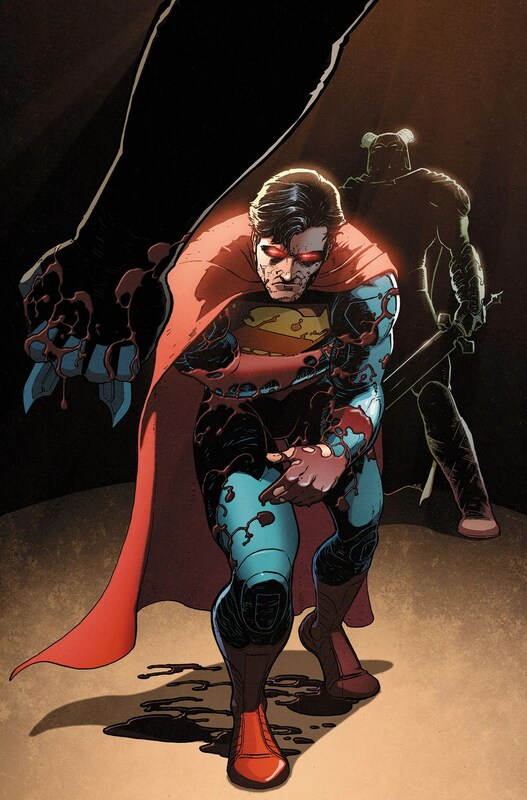 Cover art by Ivan Reis, Joe Prado, and Rod Reis. DC Comics presents a new Justice league team – the JLA – Justice League of America. How is this team any different than the Justice League? That’s a good question – and the answer is that while the Justice League united by chance and circumstances, the JLA were created with a single goal in mind – a counter measure against the original Justice League. They are recruited to counteract each of the Justice League‘s abilities and skills: for example, they are strength enough to stop Superman; skill sufficient to overwhelm Wonder Woman; manipulation more creative than Batman‘s. Issue #1 gradually introduces and builds up some back story on each of the new or returning characters. ARGUS returns, having not made an appearance since early issues of Justice League, as they continue their covert activities. Amanda Waller, a high ranking member of ARGUS, wants a powerful, and effective solution for taking on the Justice League. To be perfectly cynical: this new team, this Justice League of America, is a weapon. Steven Trevor – an experienced soldier and a central character of the issue – wants the team to grow into something more than just a defense mechanism, however. Trevor is a likeable character. He has been through hell since he fell in love with Wonder Woman. He starts in a new direction, however, and it’s great to see Geoff Johns writing the character as a leader concerned for his new team, particularly the younger heroes: Stargirl, aged 16, and Vibe, aged 18. There remains a danger that the character could become a “Nice Guy” without any further development. David Finch, billed as the artist of the issues alongside colourists Sonia Oback and Jeromy Cox, create strong art for the first issue. Trevor clashes with some of his new recruits, fighting with Catwoman in a hotel suit thick with shadows. Action represented through motion lines deliver a sense of fluid motion punctuated effectively with Rob Leigh’s lettering. Hawkman, Catwoman, and Martian Manhunter all are given a full page when they appear, depicted with the audience looking up at them. Fine details, colour, and ink combined give a great impression these characters. It’s impressive stuff. Definitely worth reading for fans seeking a good team comic, and readers looking for a place to start reading DC comics.